My granddaughter and I love having tea together and this set will be passed on to her so the memories can continue with her daughter. Ordering was easing and my daughter was surprised and pleased. I bought this set for my brother for Christmas and he absolutely loves it. Perfect for the tea aficionado in your life. This product is high quality and love the look. I got it for my girlfriend as a gift. she loves it. I have just begun to drink tea and this is my first tea set ever. It is a great price compared to the other sites I looked at. It seems small when you open the box, but it hold more water than you would think (about 2 cups). Its a good personal pot or to share with your one other person. very lovely, thank you! holds more tea than you would think and packaged very lovely. The tea set makes Japanese and Chinese food even more of a delight. Keeps the tea warm throughout the dinner, and guests are so impressed. Will order another soon for Christmas present for tea loving relative. This tea set is very, very nice. Pouring tea from one of these teapots is one of the most enjoyable tea experiences I've ever had. It feels like the shape of the spout has been finely tuned for its purpose. My clay teapot has its place, and I have no complaints about my porcelain one, but this is The One. Have to admit my comparison to Teavana--those upselling, over priced retail jockeys. My mom wanted a tea set with dragonflies, and I convinced her not to get the one from Teavana which was a stouter-shaped, more expensive version...might have been slightly more 'pretty', but not by much. I also added 5 flower saucers, and 3 more dragonfly cups in varying color--the same thing at the earlier mentioned retailer would have been double the price even with a 10% discount. Won't know if the tea set holds true to it's durability until more use and more time goes by. Didn't notice this was made in China. 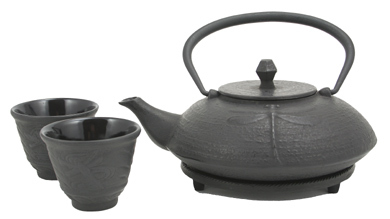 Overall it is a decent tea set, but there are several cuts on the handle connected to pot. I haven't tried yet and hope it won't get rusty. Got this when I was told I would and it is amazing looking. I was very pleased with this set and so was my boyfriend when I gave it to him for Christmas. I will be ordering from this company again when I need more tea items. Good service and beautiful product! I from Malaysia and bought this for my gf. She so happy with the product. Thanks! Its everything i thought it to be. I love it!!! The most professional service. I ran into some problems with shipping and they handled it in the most efficient way. Thank You for a positive experience. I will be buying more items. Love dragonflies so HAD to have this tea pot. First iron one I ever owned! Really keeps the tea hot. So glad it came with the tealeaf strainer too. I know we will enjoy drinking our tea from the special cups. this is a beautiful cast iron set and it is big most sets at this price are much smaller I am thinking about buying another. This set is exactly as advertised. Beautiful design. This set is really lovely and practical. It was a gift for our sister. She loved it and uses it daily! 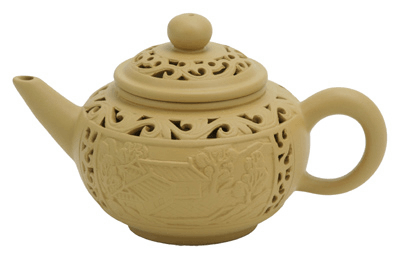 This is a nice heavy cast iron tea set that shipped for a great price. We've used it several times now and some black seems to rub off and I'm not sure what that means, or if something is leeching into our tea. The look is beautiful and it hold in heat very well. I'll have to follow up if the color doesn't quit coming off. I hope it's just something that in a few more uses will quit. 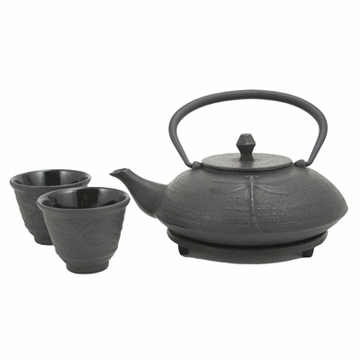 I was very impressed with the quality of the tea pot, and all the other items that came with it. Perfect size for two people, my husband and myself have been enjoying tea since we purchased it. I was so impressed with it my coworker also bought one for a gift. 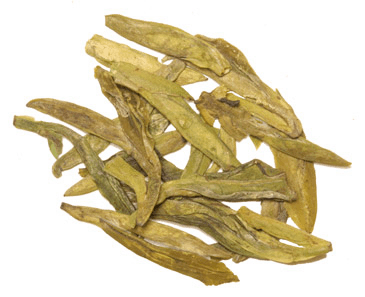 I was looking around at local tea shops and they were much more expensive.